In appose to Turkey, where makers are being left to build instruments without a hassle, in Syria the situation is different. The country that was once the proud of Arab culture, music and food, is now at the edge of catastrophe. Yet, there is hope, and some lights shines from the Oud makers from around Syria. Some makers have stopped making instruments, and some continue. Having transportation a big issue, made it harder the get the hand on a real Syrian oud. I would like to review the makers who are active today. We pray for the day that borders will be open again, and the makers would be able to live of their hand work proudly. The legend of mid-range Syrian oud. Located in Aleppo (Haleb), on the east of Syria, he is known for good solid quality ouds and Kanuns. Ibrahim has studied mechanical engineering after school, and started making instruments straight away. He came up with an idea to be followed by mane later: A screw along the neck/body connection that allows you to easily tilt the angle of the Oud’s neck. This way, you can get your desirable string’s action easily and without risks. His ouds are characterized with clean work, good local wood such Syrian walnut and warm old-style sound. Unfortunately, since the war has arrived to Aleppo he stopped making instruments. After investigating the Oud’s world in a quest for the perfect sound, Mansur has started producing ouds with a unique sound stamp. He met sound engineers and oud makers from Europe, and came up with some ideas regarding the the shape of the reinforcement spars. His ouds are built massive and strong, and give a very strong volume output. He is loved among many musicians around the world. Mansur Haidar builds both floating bridge and fix bridges ouds. As a pretty new maker, Walid hasn’t won his fame yet. But eyes are open, and his work attracts much attention among Syrian oud fans. Walid’s oud are built for comfort as a first priorirty. By looking at his ouds, yes can easily see the small bowl shape, low string action and slim neck design. They are very easy to hold, and fun instruments to play. Using special ornaments techniques like filling and inlays, his ouds are also very aesthetic. We hope to see much more of his work in the future. 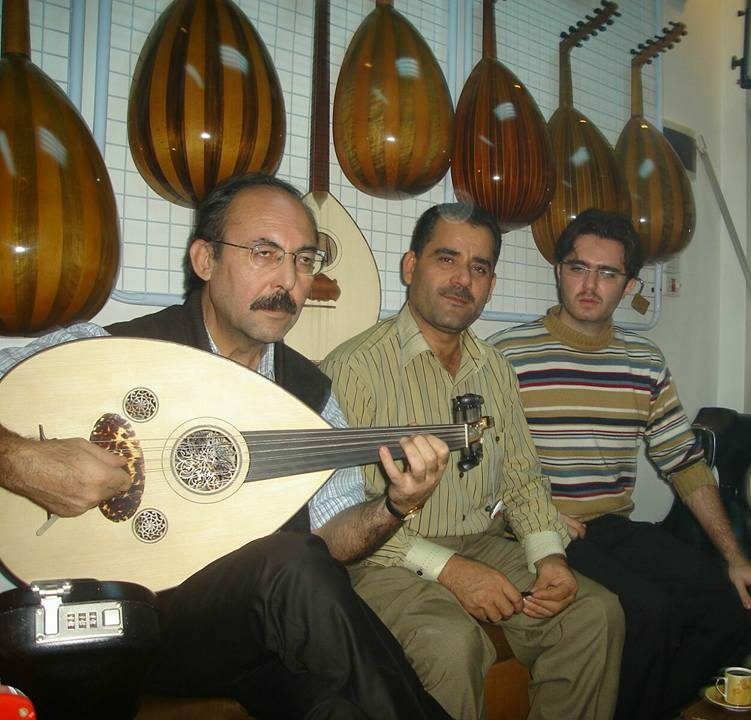 Ibrahim’s cousin, the less known oud maker from Aleppo. Naeem was working hand in hand with Ibrahim until the civil started. He knows by heart every function, shape and tool to make the his brother Ibrahim’s. His ouds look much alike Ibrahim oud, but some new decoration and modern protection elements have been added. For example the hand-guard that keeps the oud clean and safe at the place where the right hand embraces the oud. The same woods are in use, and the same technique. The sound is also 100% faith to Ibrahim’s ouds. We are sure that in the coming year (2019) we will see many of them coming from Aleppo.